I think the 1st day of Janathon is more about more about motivation than actual exercise. After the past week and a half of beer, fatty foods, afternoon naps and warm evenings sat on my backside, going out into the rain for “fun” wasn’t top of my things to do. So I took my 2 year old so with me for moral support. 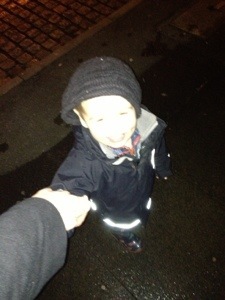 He was chuffed to be going out for a walk, in the dark, wet evening, mostly because I’d bribed him with going to Tesco & buying a toy car. So together we walked the half mile to Tesco, and spent a good ten minutes checking all the different cars for the best one. We choose a yellow one & then headed home. So there we go, one mile (carrying a 2 year old & a car for about 1/3) on the 1st of Janathon.